For fall lovers everywhere, this time of year is key for autumnal shades. Think: oxblood, chestnut brown, forest green, and burnt orange. 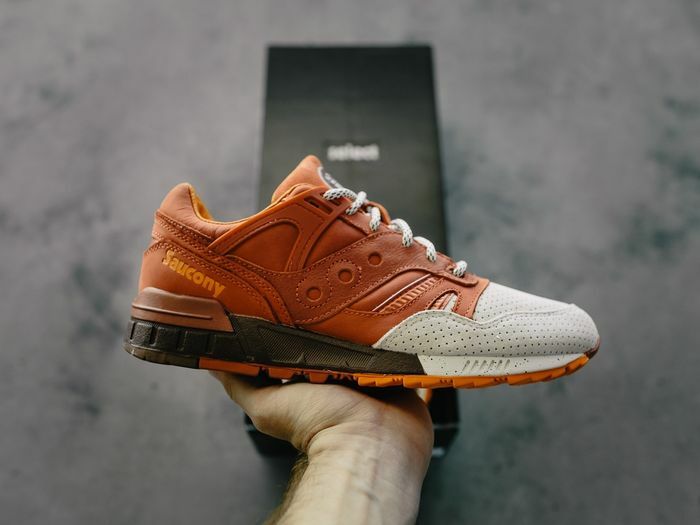 But because it is fall after all, the athletic brand Saucony has debuted a sneaker in a much more recognizable color name: Pumpkin Spice. It’s kind of crazy to think how a Starbucks drink craze has gone this far. After all, it was the PSL that fueled this annual obsession for all things orange-hued and cinnamon/nutmeg/clove-smelling. Here’s how it translated to footwear: As High Snobiety reports the “Pumpkin Spice” Grid SD, blends leather, suede, and metallic fabrics together and comes with a Ground Reaction Inertia Device cushioning system. In layman’s terms, this comfy shoe is more than just the same shade as autumn’s signature produce. It’s also quite cozy, which, to its credit, is quite in-line with its inspiration. Surely, this is a sign we’ve reached peak fall. But for those who can’t get enough, the shoe becomes available to purchase online on October 21. Check out the pumpkin spice Saucony style, below. For all other sneaker lovers, check out the comfy, cool styles that fashion girls are obsessed with.